1 Combine garlic, lemon juice and lemon, paprika, oregano, Stock Powder, oil and chilli in a bowl and mix well. Place chicken in a large dish and pour over marinade. Cover and refrigerate for at least 1 hour to allow the flavours to infuse. 2 Preheat oven to 190°C. 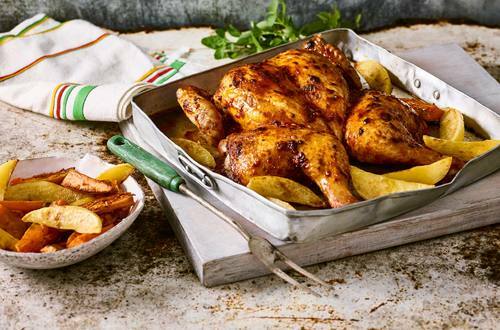 Place chicken in a large roasting dish and place potato wedges around. Roast for 45 minutes until the skin is golden and chicken cooked through.